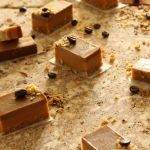 Since my no bake peanut butter bars, were such a success, at home, and among friends, I decided to adapt the recipe, and make these decadent chocolate peanut butter bars. I made a thin, nutty date base, followed by a rich, smooth, peanut butter layer, and a perfectly infused coffee and cocoa layer on top. 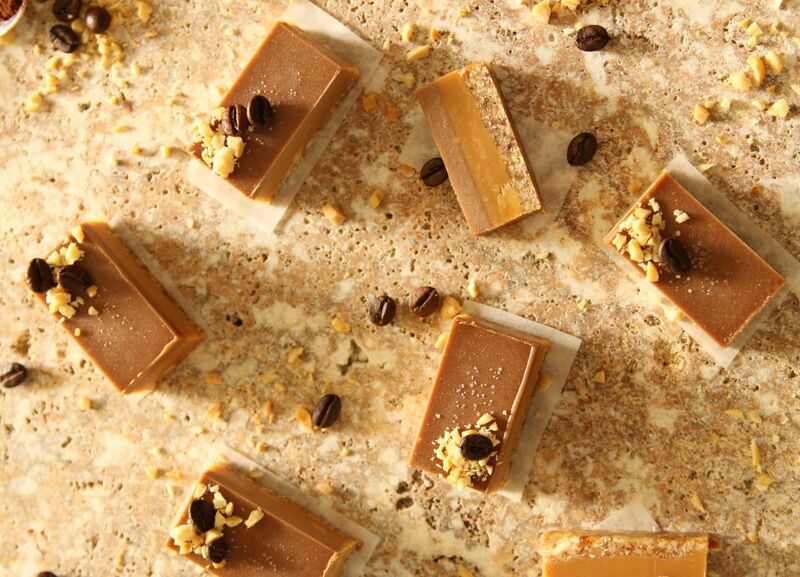 I decorated the bars with coffee beans, a sprinkle of sea salt, and some finely chopped peanuts. But back to these chocolate peanut butter bars. They’re not too sweet, you don’t need to soak any cashews, to make them, plus, they store for up to 2 months, in the freezer, so whenever you want to indulge in a peanut butter treat, all you need to do is take them out, to thaw for 5 minutes, and voila! Just make sure you refill your stash, or you’ll end up, like me, opening the freezer and discovering you ate them all. For the base, add the medjool dates, pits removed, into a food processor, and blend until it’s a paste. Next, add the almond flakes, and shredded coconut, and blend until combined, but still a bit chunky. Transfer into an 8 x 4 x 1/2-inch (20 x 10 x 6 cm) loaf pan, lined with baking paper, and press it down evenly, to form a base. Add roughly an inch (2.5 cm) of water into a small pot, and bring to a boil. Take it off the heat, add a heat proof glass bowl on top, then place the coconut oil into the bowl to gently melt. 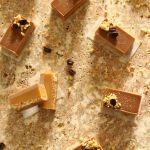 Next, add the peanut butter, and maple syrup, and whisk until combined, then pour the peanut butter layer on top of your date base, and pop it into the freezer to set, while we prepare the chocolate layer. For the chocolate layer, bring the pot to a boil again, if needed, add more water, then take it off the heat, add a heat proof glass bowl on top, and add the coconut oil to gently melt. Next, add the almond butter, maple syrup, vanilla essence, and coconut cream, and whisk until combined. Finally, add the coconut sugar and cocoa powder, whisk, and pour on top of the peanut butter layer. Smooth it out, by jiggling the tray, and gently tapping it on the counter top, to get rid of any air bubbles, then pop it back into the freezer for an hour, or until set. To slice, take the tray out of the freezer, dip a chef’s knife into a glass of hot water, dry it, then slice into desired size. Repeat this stage with every slice, to ensure a clean, and smooth cut. 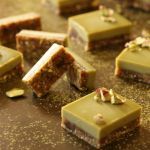 If you’re looking for another freezer sweet treat to indulge in, then try my Matcha Slice bars! They’re refreshing, easy to prepare, refined sugar free, and no soaked cashews needed. Remember, sharing is caring darlings! ← How To Make Vegan Tortillas From Scratch! Yuuuuuuum! There’s a quote I need to use more often 😉 Pinned this for later aka my next peanut butter craving!